Who would have thought finding a water filter for your home could be such a complex process. Reverse osmosis, distillers, alkaline remintralisers, UV filters... so many filter technologies and every company claims that their product is the best. In this article we're going to look at how all these filter types work, the pro's and con's of each filter before finally providing you with the 'best water filter for your needs' (which you can straight to by clicking here). If you're not convinced that you need a water filter, I highly recommend reading 18 Reasons Why You Must Use A Water Filter or reading through the key points below. If you are already aware of the horrible things in our drinking water, then skip this section and move on to 'types of water filters' below. Tap water contains toxins such as chlorine, pesticides, heavy metals, radioactive material and other nasties. Most municipalities add fluoride to your drinking water. Fluoride has been classed as a neurotoxin by the worlds leading science journal. Tank/Rain water is often contaminated with E.coli and other pathogenic bugs. Most rain water is stored in plastic tanks - the BPA in these tanks leeches into your water. BPA is an endocrine disruptor and should be avoided. Glyphosate (Roundup) was found in 85% of rainwater samples taken in the USA. Spring/well water is often contaminated with pesticides, nitrates, petroleum byproducts, heavy metals and radioactive material. Not to mention animal waste and decay. For references on the above claims and more on this topic, please read my article on why you must filter your water by clicking HERE. When it comes to buying a water filter the first question you will be faced with is 'what type of water filter do I need'. Below I have broken down the most common water filter types including an overview of how they work and the pro's and con's of each. Please note - a lot of manufacturers use multiple filter technologies in their products. This is a sensible approach. The below section purely looks at each filter technology on it's on. Later in this article we will look at complete setups that incorporate various technologies into the one product. Also - filter quality depends on the manufacturer.The below are simply general guidelines, before buying any filter, check with the manufacturer to ensure it is up to your standards (most manufacturers should test and certify their products with a third party organisation such as NSF International or Water Quality Association). Popular with people whose water supply is from the local municipality as reserve osmosis (RO) filters remove the neurotoxin fluoride from your drinking water. RO systems use a membrane that only allows only certain particles, molecules and ions through (known as a semipermeable membrane). This allows various types of bacteria, and contaminants such as arsenic, nitrates and fluoride to be removed from the water. Mechanical pressure is applied to an impure solution to force pure water through a semi-permeable membrane. The downside of this technology is that it wastes a lot of water. RO systems result in about 10x more waste water than filtered water, making these systems not ideal for places where water is scarce or costs a lot. 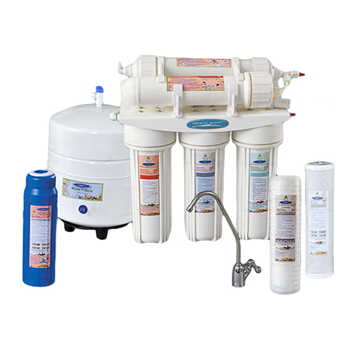 Also, RO filters are known to remove a lot of beneficial minerals from our water (natural salts for example). The World Health Organisation have reported that demineralised water is not suitable for drinking (2). I cover this topic more in the distilled water section below. Filter companies may use a 'remineraliser' in there setup to add these vital minerals back into your water. May taste 'bland' as all the minerals have been removed. UV water filters use an ultraviolet lamp light to inactivate or kill bacteria and other living micro-organisms such as viruses and cysts (Giardia). However they do not filter out particles or other chemical containments. These filters require an electricity source to power the UV bulb (which needs replacing every 6-18 months). Sterilises water - killing any pathogenic bacteria, viruses and cysts. Requires clear water for optimal results. Distillation is the process of boiling water to create water vapour, this vapour is then cooled and turns back into a liquid - dropping down into a seperate chamber. This process separates solutes as they will not vaporise, however some contaminants will be carried up with the water vapour and end up in the end result. Water distillers are effective at removing (and killing) containments in a water source. However, there is a big problem with distilled water, as all minerals are lost, drinking distilled water pulls minerals from the body. This can cause a lot of health issues, especially if distilled water is drunk for an extended period and or intake of these minerals is lacking in a persons diet. The World Health Organisation prepared a reported titled 'Health Risks From Drinking Demineralised Water'. This report shows that drinking distilled water leads to the loss of electrolytes in the body and increased diuresis - dehydrating the body. If you are drinking distilled water, you must supplement with minerals such as potassium, magnesium and calcium. 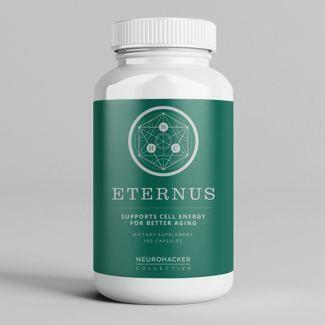 A trace minerals product would be a good idea. Also "Demineralized water may also increase the risk from toxic metals because it more readily leaches materials from piping like lead and cadmium, which is prevented by dissolved minerals such as calcium and magnesium. Low-mineral water has been implicated in specific cases of lead poisoning in infants (3)"
For more on this topic please read Early Death Comes From Drinking Distilled Water. Volatile organic chemicals that convert readily into gases are not removed. Carbon water filters bond with contaminants as water passes across the filter. What they filter depends on the technology used and also the quality of the filter - some carbon filters remove very little. Others will remove a wide range of chemicals, particles and heavy metals. 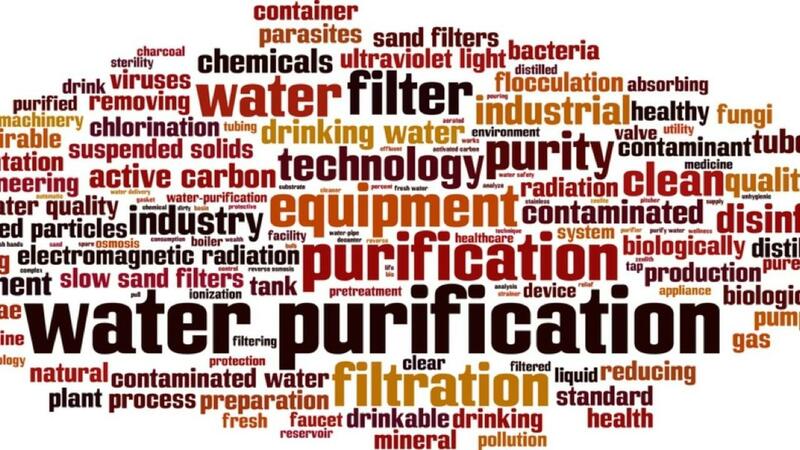 There are two main types of carbon filters used in water purification - granular activated carbon - which uses lots of tiny activated carbon particles that the water flows across. And carbon block - which is simply activated carbon in one block. [Carbon Filter] performance depends upon the amount and the type of carbon, the way the filter is designed, and the residence time of the water. Carbon blocks in general work better than GAC (granular activated carbon) filters, though many of the latter can do a fine job. GAC is usually of the consistency of coffee grounds, so it is subject to "channeling" and "fluidizing". Solid carbon blocks keep the carbon in place and do not let it wash away. Carbon filters are one of the most common and oldest ways to filter water. The Ancient Egyptians used to use carbon to filter their drinking water as they found it tasted cleaner. 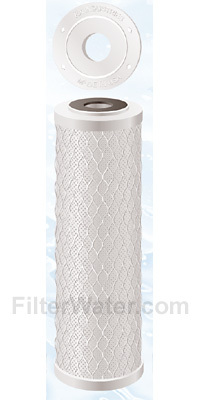 when people taking about a water filter, they are generally referring to a carbon filter. The filter attracts the contaminants at a molecular level - effectively they get stuck to the carbon filter. This means the filtration rate will slow with use and eventually need replacing. Carbon filters typically don't remove cysts from the water, but as the carbon filters have improved over the years, tests are finding that the tightly packed carbon can actually filter out cysts, though for best results use a distiller or RO system. The same is true for heavy metals such as lead and mercury. Carbon does not easily filter these things but some newer filters have had success. Fluoride and arsenic will not be removed by carbon filters either. Carbon is extremely effective at removing chlorine however. Even a poorly designed carbon filter will remove chlorine (which is why carbon filters are usually packaged with RO systems - actually chlorine will damage an RO membrane, so stay away from RO systems that do not have a carbon filter). Relatively low cost way to filter water. Not all carbon filters are equal. Quality varies dramatically. Ceramic filters are an inexpensive and rather effective water filtration method. The filters have tiny pores that allow water to flow through whilst blocking contaminants bigger than the pore size. Ceramic filters effectively remove larger microbial cysts, protozoa and bacteria, but viruses are not blocked due to their small size. Often ceramic filters contain silver which acts as an anti-bacterial helping eliminate further bacteria in the water. There are two main types of ceramic water filters, the ceramic pot filter and the ceramic candle filter. The pot filter is often used in developing countries and was commonly used in recent centuries. These filters comprise of two chambers, separated by the ceramic filter with it's tiny pores. Water is poured into the top chamber and it filters through to the lower chamber ready for drinking. The smaller ceramic candle filter allow the filters to be installed in metal and plastic containers or alongside other filter technologies. This reduces risk of cracking, leaks and costs. Also, some manufacturers use carbon filter technology inside their ceramic candle filters, improving the filtration rates in the one package. As ceramic is prone to cracking, there is a risk of these filters forming hairline - nearly impossible to see - cracks. This uses tiny plastic 'micro-beads' that acts as a medium of ion exchange - trapping of ions whilst release of other ions. This process can be used to remove heavy metal ions from water (such as lead) and replacing them with safer ions such as potassium. The plastic beads (resin) requires recharging for the filter to continue to work, but most household devices simply have the user replace the resin when it can no longer be used. This filter technology will not remove chemicals, or microorganisms. There are many names for this filtering technology, including Copper zinc water filtration, Oxidation/Reduction, KDF (Kinetic degradation fluxion media), CuZn filters and more. [Use] of copper and zinc creates an electro-chemical reaction. During this reaction, electrons are transferred between molecules, and new elements are created. Some harmful contaminants are changed into harmless components. Free chlorine, for instance, is changed into benign, water-soluble chloride, which is then carried harmlessly through the water supply. Similarly, some heavy metals such as copper, lead, mercury and others, react to plate out onto the medium's surface, thus being effectively removed from the water supply. The filter process can successfully removes chlorine, heavy metals, iron whilst lowering counts of some inorganic contaminants and microorganisms. It doesn't remove pesticides, cysts like giardia and protozoa. Typically this filter will be used with a carbon filter, with the Redox filter being first in line. What Filter Do You Need? As you would have noticed, each filtration method has it's strong points but also it's weak points. Carbon filters are great for removing chemicals and chlorine, but won't get rid of fluoride. UV filters will kill off all the bad bugs, but don't remove heavy metals and need clear water to work effectively. Unfortunatley, there is no one single filtration method that does it all. I know many claim distilling water is the best system, but as outlined above, there are many negatives with this method. Thankfully though, manufacturers are not silly and have made things easy for you. They have combined various technologies to create comprehensive water filtration systems. I have spent many hours trying to figure out what is the best setup for filtering water. As a result of this search I have settled on three systems. Each system will successfully remove all common nasties (VOCs, microorganisms, heavy metals, fluoride etc). 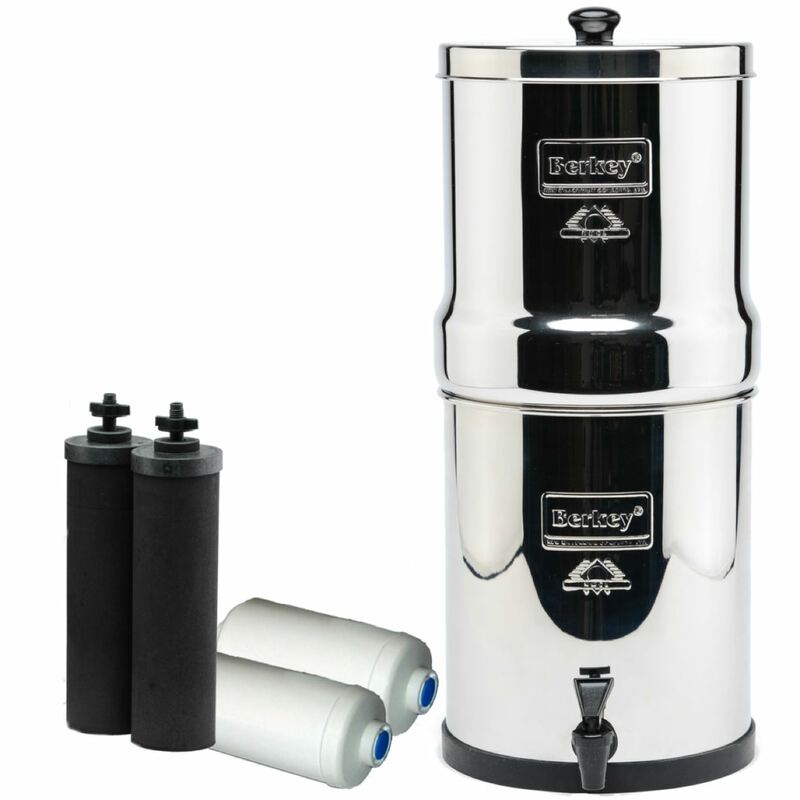 The Berky Water Filter is a low cost (around $250-300) extremely effective system, but with a few minor drawbacks (slow filtration rates, above sink setup). It's perfect for backup use (it doesn't require electricity) and for those who rent or move about frequently. The 'Big Berky' (as it's flagship model is named) is widely used across the world as a low cost, electricity free, extremely effective water filtration system. It works by simply pouring water into the top, and the water works it's way down through the filters to be stored in the bottom storage tank. Though their filtration methods are 'company secrets' it is possible to get a pretty good understanding of what the Berky uses by looking at the information the company does share. The Berky uses six different media (filter) types. The first line of defence involves microscopic pores (my guess it's a ceramic style filter). Next they use adsorption and absorption properties - this indicates a carbon filter setup. They also admit to using an Ion Exchange process - so we know there is an Ion Exchange filter inside the Berky. Combining ceramic with carbon and ion exchange, along with three other filter types (undisclosed by the company) creates one of the most effective water filters on the market - even though it comes in at cheaper end of the price range. How effective is the Berky at filtering water? Well it is used across the world by relief organisations such as UNICEF, the Peace Corps & Red Cross Societies worldwide. Also, water testing laboratory WaterFilterLabs.com found the Berky Filter to be the best countertop filter on the market. Fluoride - Removed to greater than 99.9%. Viruses – Removed to greater than 99.9%. Pathogenic Bacteria - Removed to greater than 99.9%. Lead - Removed to greater than 99.9%. Arsenic - Removed to greater than 99.9%. Iron - Removed to greater than 99.9%. Mercury - Removed to greater than 99.9%. Chlorine - Removed to greater than 99.9%. Trihalomethane(THMs) – Removed to greater than 99.8%. Bisphenol-A - Removed to greater than 99.9%. Chloramines - Removed to greater than 99.9%. Pharmaceuticals - Removed to greater than 99.5%. Petroleum Contaminants - Removed to greater than 99.9%. Methylcycohexane-methane - Removed to greater than 99.9%. Pesticides - Removed to greater than 99.9%. Heavy Metals - Removed to greater than 99.1%. Coliform and e-Coli - Removed to greater than 99.9%. Atrazine - Removed to greater than 99.9%. Uranium - Removed to greater than 97.0%. Gross Alpha emitters - Removed to greater than 98.7%. You can see more about these independant tests (and the original reports) at Berkey Water Filter Lab Test Results - What does it remove? You can see why I personally use this filter at my home! Note - the standard filters that come with the Berky filter do not filter fluoride. To filter fluoride with the Berky you must purchase the PF-2 addon on filters. If your water source is spring water, rain water, or even coming from a lake (the Berky can filter lake water, and even pool water!) then you will not need these extra filters. 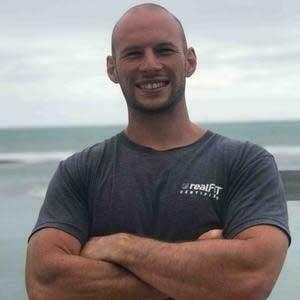 A note for Australian and New Zealand customers - DO NOT order from Truwater.com.au or Truwater.co.NZ They may have cheaper prices but their service standards are appalling. I ordered from them after phoning to check their filter was in stock, a month later I still hadn't received the filter (despite chasing them up 4x). Then I asked for a refund and never heard back from them for 2 weeks despite calls and emails. Then, 6 weeks after placing the order the unit arrived... but it was missing a vital piece (the plugs for the urns). Now it's been 2 weeks since I received the (un-usable) urn, and despite emails, live chats and phone calls (most of which have left me 'on hold') I still don't have the plugs nor any idea what is going on. Pay a few more dollars and buy from a company that doesn't treat their customers like dirt. The second option - The Thunder 4000M RO/UF System is mid priced ($500-700) setup that uses Reverse Osmosis, Carbon filters and UV filters. With this setup you are going to end up with water that is free of all the nasties. This is an undersink setup so it may not be suitable for everyone. Plus as it uses RO technology, this is a lot of waste water - so if you're paying for water use or live in a dry area, it may not be the best setup for you. You can see how clean the water this unit creates in THIS report. Finally, there is the issue with demineralisation and RO systems. For this reason I would recommend adding a remineraliser to the Thunder 4000M system setup. If you're looking for a top end water filteration system, then you should go with a whole house setup. These systems are quite elaborate (and expensive, ranging from $1000-3000+) but it's great for homeowners as it is a full house setup. Meaning water to your dishwasher, shower, garden hose and drinking faucet will all be filtered. 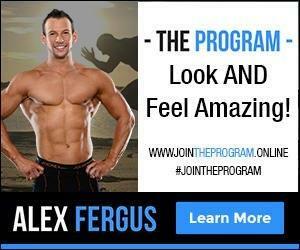 This is important if you are serious about you and your families health. Showering in water that contains chlorine can be inhaled and also causes skin irritation for instance. Likewise there is no point filtering your drinking water, only to get Giardia on your toothbrush. And I'm sure you don't want to water your vege patch with water that is contaminated with pesticides and petroleum byproducts. So what sort of system would I recommend, well at this level (and expense) you want to talk to your local water filter company to get something suited to your house and water supply. Someone on well water may need something slightly different that someone on town water supply for instance. It may even be wise to do a water analysis before you purchase a filter - just to see what is coming through the tap. 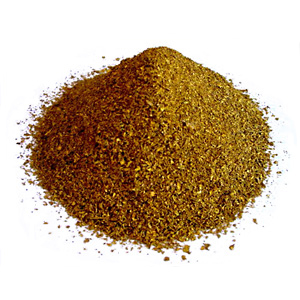 If you have a lot of manganese and iron, you may need something specifically suited to that for instance. Also, if you live in an area where you harvest rain water, and this water is rather sparse (i.e. Outback Australia, or in drought prone rural areas) then a RO system or a Redox system may not be suitable (as there is a lot of waste water and backwashing required for these). A UV filter to kill off any nasties. There are many different brands, models and setups that you could use for this (you could even build your own setup), but the Eagle 1000A-SS Budget Whole House System Stainless is a good lower cost choice. The Eagle 1000A is an 11 stage system, using carbon filters (both GAC and solid carbon), Ion exchange, sediment pre-filters (removing dirt and silt, extending the life of your filter system), in built remineralisers, UV filters and Redox filter technologies. For me in New Zealand I am looking at more of a carbon and UV filter with multiple particules/sediment pre - filters for my rain water (and potentially spring water) supply. This is the type of unit I am looking at The Bug Buster Pro Series Platinum. At the time of writing I am thinking of getting the Bug Buster unit for my rain water - this would then be used for showering, dishwasher, washing dishes and cooking. And then when (if) I tap one of the springs on the property, I may just run this water direct to the house with it's own tap and filter this water through my Big Berky and use it for drinking. But what works for me may not work for you. Hopefully the information shared int his article will help you make an informed decision based on your situation. After writing my first article on water filters - 18 Reasons Why You Must Use A Water Filter - I received a few emails asking for filter advice for specific scenarios. Below I have shared my thoughts and recommendations for the best filter for particular goals. If your situation isn't listed below and you would like some advice, feel free to leave a comment below and I'll get back to you. 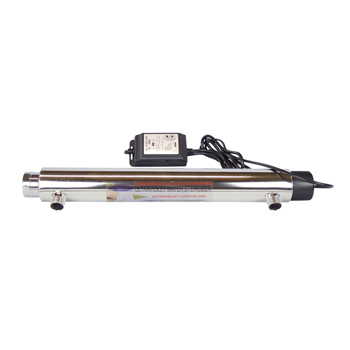 For this I would go with a countertop RO system - such as the Portable Reverse Osmosis System. This unit uses both carbon and RO filters, so you have your main bases covered. I used a unit like this when I was renting a small apartment in Sydney. OR - if you have enough bench space or a large enough pantry, then get a Berky - you could look at getting the smaller 'Travel Berky'. Just remember to get the extra fluoride filters. The great think about both of these units is that you don't need to mess around with the plumbing and when you move you can take them with you. Note - if your local water supply doesn't have fluoride added (lucky you) then you could go for something like THIS that doesn't use RO. You could look at the options above if you think you will be moving soon, and or don't want to mess around with the plumbing. Otherwise get something to go under your sink. Here I would go with a multi-stage RO plus carbon filter system with storage tank and remineraliser. The The Thunder 4000M RO/UF System I mentioned above would be a great unit here. Just remember to get the remineraliser add on. Next, get a shower filter to remove the chlorine from your shower. Note - if the budget allows it, then you could go with the whole house setup like the Eagle 1000A. The Berky is the perfect filter here. Get one based on how many people will be using it. The Travel Berky would be great for 2-4 people. But there are much larger units. If you are looking at using it for sports, there is a plastic BPA free Berky that would be lighter to travel with. Remember, with the Berky you can feed it pool water or dirty lake water and the filtered water will come our pure. Check out the videos on youtube if you don't believe me here! Again the Berky is the go to choice here. You can put in any water - rain water, spring water, contaminated tap water, pond water, chlorinated pool water... and it will remove all the nasties. It can be stored in the garage or pantry for when disaster strikes. We get a lot of power outages where I am based, so this was another reason why I own a Berky. If the power goes out and our water pump isn't working, I can easily go out and get a bucket of water from the creek and filter it through my Berky. If you do a bit of travelling and are sick of paying top dollar for bottled spring water, then I would suggest you purchase a Go Berky. These are small travel friendly units that you could pack in a carry on bag. Taken them when you go to friends homes (who don't filter their water) or if you go out camping, or even leave it in the car. The only thing missing with the Go Berky is the fluoride filter - they are too small of a unit to also include the fluoride filter attachment. I really hope this article has cleared a few things up when it comes to filtering water. I know when I first started looking at water filters I was very confused. I would go to a website like FilterWater.com and be overwhelmed with all the options! Trying to figure out what is the best was rather difficult! 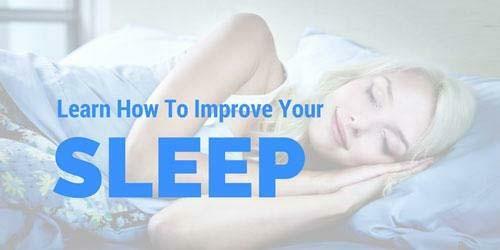 If you still have questions about water filters, please leave a comment below and I'll do my best to get an answer and update this article. It's been a while since I wrote this blog, and thought it would be a good idea to update you all on my home setup. I have my Berky Water filter now in the cupboard - this is going to be my 'backup' filter should the power go out, or I am travelling. I still recommend this filter for those on a budget, or who want something that works when the power fails. We're currently using rain water, so I'm not worried about fluoride in this setup. I must say - the water is very clean and tastes amazing.